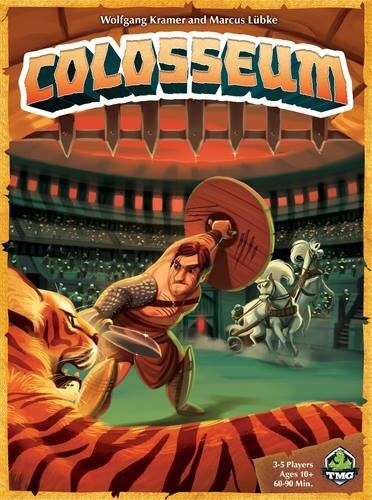 Earlier this year Tasty Minstrel Games announced it would use Kickstarter to fund a reprint of the popular Days of Wonder game, Colosseum. Recently, the new cover art was released. If you’ve ever waded into the gladiatorial arena of gamer opinions, it bears all the markings of a true death match. There are those that take no mercy. There are some that are more timid in their approach and get mauled quickly by the lions, and there are those like me who sit in the cheap seats and watch the bloody spectacle from a distance, looking for just the right time to fling rotting vegetables onto the fighters below. 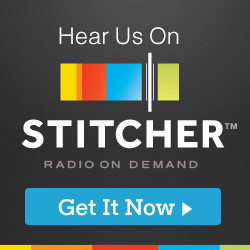 Um… This is a joke, right? HAHAHAHA! That is horrible box art! Hate hate haaaate that art style myself. A real turn off and makes me feel like I’m playing a kids Channel game. It’s not April 1st guys. I’ve been wanting the game but if that’s the art style, I want nothing to do with the new version. It is bad art though. That is a terrible drawing. That looks pretty bad. What were they thinking. Pretty lame. The original looks great, and I understand that they have to differentiate their version, but if I saw this on a shelf and wasn’t familiar with the game, I’d probably pass it up. Suddenly I’m less excited about the release. Hummm…like the old cover better. I’d play the hell out of it. Of course, I play the hell out of Glory to Rome. Don’t let “bad art” get in the way of playing great games. I think my main issue with this is it doesn’t scream ‘deluxe edition’ to me at all. I dig the new cover. Lots of style. I think it stands out more than the original cover. I like it a lot more than the original art. 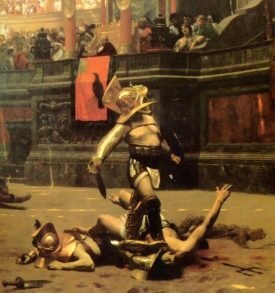 And by “great arena,” I’m pretty sure Commodus meant Facebook. Thanks for the kind words, Dave. I loved your quote!